Coordinated data sharing is important for government jurisdictions that overlap the same geographic area. For efficient planning and operations purposes, each jurisdiction should have knowledge of the other organizations’ activities that may affect them. 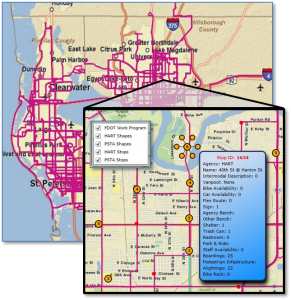 Florida Department of Transportation (FDOT) District 7 (D7) has identified the need to obtain and view spatial data from many public transportation agencies within FDOT D7 and across the West Central Florida region. This ability will greatly increase the efficiency of FDOT D7 employees that use public transportation information in their workflows. Furthermore, it will assist the regional public transportation planning efforts in FDOT D7. Past efforts for intra-regional data sharing have included the manual transmission of datasets via email or File Transfer Protocol. However, manual data sharing is difficult to sustain at a high frequency due to the manual effort involved in collecting, formatting, sending, receiving, and processing the data. Additionally, each dataset may be in a different format, which makes comparison and coordination among agency datasets difficult and time-consuming. If the perceived effort to exchange data is too great, old and outdated datasets may be used in place of new data, even if new data are available. 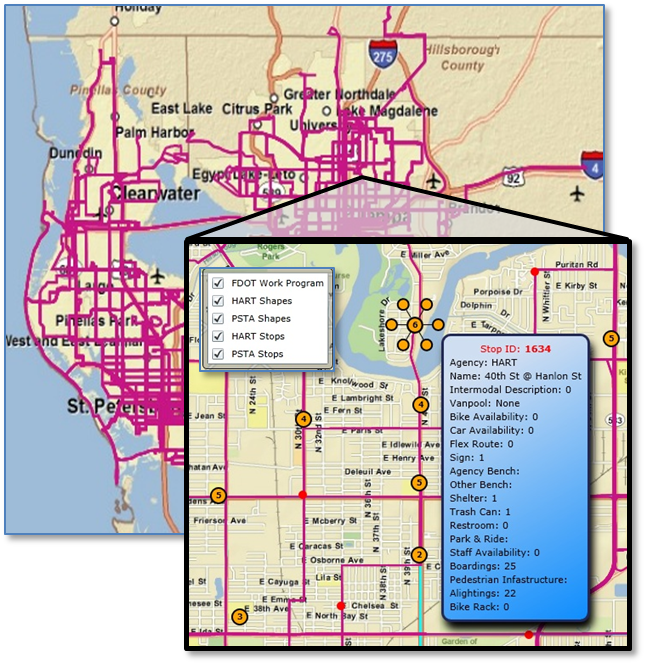 The research team, along with feedback from FDOT D7 and the transit agencies in its region, successfully developed and demonstrated a prototype software system that is able to automatically retrieve General Transit Feed Specification (GTFS)-based datasets (describing transit stops, routes, and schedules) from local transit agency websites and store them in the FDOT D7 enterprise geodatabase. Additionally, a Web application was developed to visualize and query transit data alongside FDOT D7 data. The resulting Web application is capable of showing multimodal data for the regional transportation systems that is always based on the most recent data available from the transit agency. Challenges encountered in this project included working with proprietary Environmental Systems Research Institute (ESRI) software that has limited examples and documentation and coordinating with transit agencies that are in various stages of collecting and maintaining their bus stop inventory data. Next steps for this project are the deployment of the system to FDOT D7 staff as well as replication of this system to other districts, such as FDOT District 1. Tools exist to assist transit agencies in developing an accurate bus stop inventory and in creating and maintaining GTFS datasets. Increasing the awareness and expertise of agencies in the use of these tools will be useful for deploying this system with data from additional agencies. Please contact Sean Barbeau (barbeau@cutr.usf.edu) or Ed Hillsman (hillsman@cutr.usf.edu) for more information. Download the Final Report and Powerpoint Presentation. This project was funded by the National Center for Transit Research (NCTR) and the Florida Department of Transportation (FDOT).